The most commonly used tool of monetary policy in the U.S. is open market operations. Open market operations take place when the central bank sells or buys U.S. Treasury securities in order to influence the quantity of bank reserves and the level of interest rates. When the Fed conducts open market operations, it targets the federal funds rate, since that interest rate reflects credit conditions in financial markets very well. Decisions regarding open market operations are made by the Federal Open Market Committee (FOMC). The FOMC is made up of the seven members of the Federal Reserve’s Board of Governors, plus five voting members who are drawn, on a rotating basis, from the regional Federal Reserve Banks. The New York district president is a permanent voting member of the FOMC and the other four spots are filled on a rotating, annual basis from the other 11 Federal Reserve districts. The FOMC typically meets every six weeks, but it can meet more frequently if necessary. The FOMC tries to act by consensus; however, the chairman of the Federal Reserve has traditionally played a very powerful role in defining and shaping that consensus. For the Federal Reserve, and for most central banks, open market operations have, over the last few decades, been the most commonly used tool of monetary policy. Visit this website for the Federal Reserve to learn more about current monetary policy. To understand how open market operations affect the money supply, consider the balance sheet of Happy Bank, displayed in Figure 1. 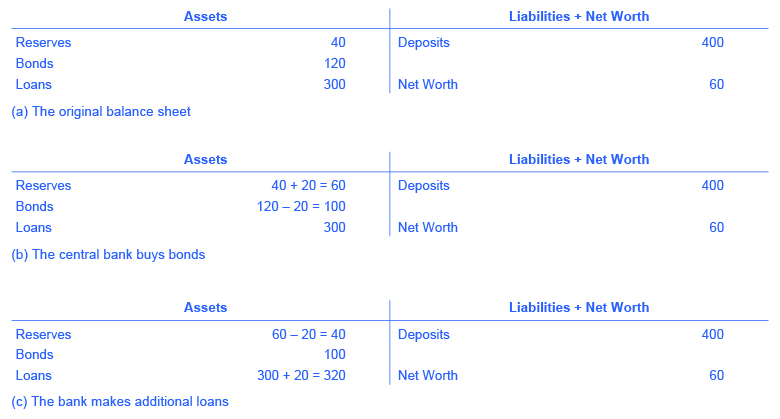 Figure 1(a) shows that Happy Bank starts with $460 million in assets, divided among reserves, bonds and loans, and $400 million in liabilities in the form of deposits, with a net worth of $60 million. When the central bank purchases $20 million in bonds from Happy Bank, the bond holdings of Happy Bank fall by $20 million and the bank’s reserves rise by $20 million, as shown in Figure 1(b). However, Happy Bank only wants to hold $40 million in reserves (the quantity of reserves that it started with in Figure 1(a), so the bank decides to loan out the extra $20 million in reserves and its loans rise by $20 million, as shown in Figure 1(c). The open market operation by the central bank causes Happy Bank to make loans instead of holding its assets in the form of government bonds, which expands the money supply. As the new loans are deposited in banks throughout the economy, these banks will, in turn, loan out some of the deposits they receive, triggering the money multiplier and increasing the supply of money. Figure 1. 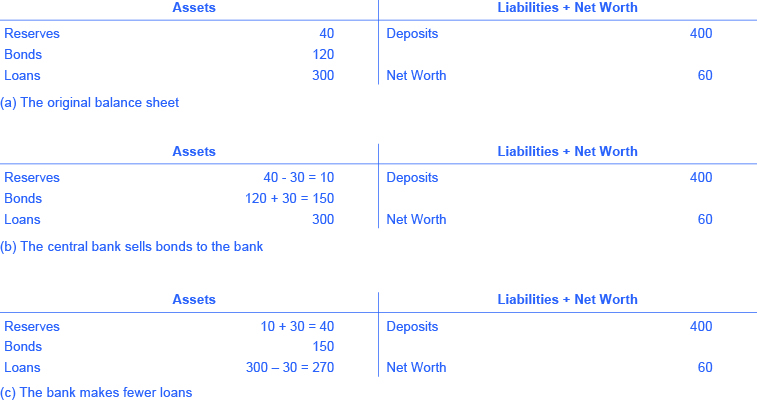 Balance Sheets for Happy Bank. Figure 1(a) shows that Happy Bank starts with $460 million in assets. In (b), the Federal Reserve purchases $20 million in bonds from Happy Bank, which lowers Happy Bank’s bonds holdings, but increases their bank reserves by $20 million. In (c), Happy Bank decides to loan out that $20 million, thereby increasing their loans. Where did the Federal Reserve get the $20 million that it used to purchase the bonds? A central bank has the power to create money. In practical terms, the Federal Reserve would write a check to Happy Bank, so that Happy Bank can have that money credited to its bank account at the Federal Reserve. In truth, the Federal Reserve created the money to purchase the bonds out of thin air—or with a few clicks on some computer keys. Open market operations can also reduce the quantity of money and loans in an economy. Figure 2(a) shows the balance sheet of Happy Bank before the central bank sells bonds in the open market. When Happy Bank purchases $30 million in bonds, Happy Bank sends $30 million of its reserves to the central bank, but now holds an additional $30 million in bonds, as shown in Figure 2(b). However, Happy Bank wants to hold $40 million in reserves, as in Figure 2(a), so it will adjust down the quantity of its loans by $30 million, to bring its reserves back to the desired level, as shown in Figure 2(c). In practical terms, a bank can easily reduce its quantity of loans. At any given time, a bank is receiving payments on loans that it made previously and also making new loans. If the bank just slows down or briefly halts making new loans, and instead adds those funds to its reserves, then its overall quantity of loans will decrease. A decrease in the quantity of loans also means fewer deposits in other banks, and other banks reducing their lending as well, as the money multiplier takes effect. And what about all those bonds? How do they affect the money supply? Read on to find out. Figure 2. Balance Sheets for Happy Bank. When Happy Bank purchases $30 million in bonds, Happy Bank sends $30 million of its reserves to the central bank, but now holds an additional $30 million in bonds, as shown in (b). For Happy Bank to maintain its level of reserves at $40 million, it needs to reduce its quantity of loans, as shown in (c). DOES SELLING OR BUYING BONDS INCREASE THE MONEY SUPPLY? Is it a sale of bonds by the central bank which increases bank reserves and lowers interest rates or is it a purchase of bonds by the central bank? The easy way to keep track of this is to treat the central bank as being outside the banking system. When a central bank buys bonds, money is flowing from the central bank to individual banks in the economy, increasing the supply of money in circulation. When a central bank sells bonds, then money from individual banks in the economy is flowing into the central bank—reducing the quantity of money in the economy. Watch this video to review how the FED uses open market operations to influence interest rates.